This picture is one of Emily´s finest, portraying the magnificence and scale of Iguazu Falls. 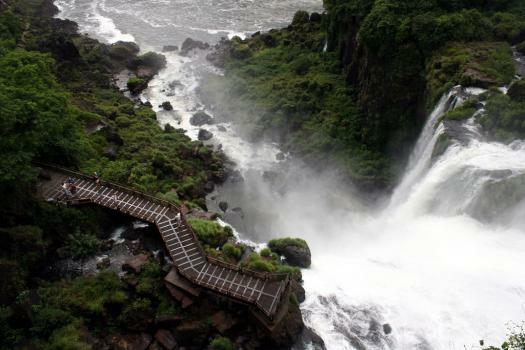 Located in northeast of Argentina, on the border with Brazil, the falls can be admired and visited from either country. A quick tidbit: Iguazu Falls are 4 times larger than Niagara Falls, and are surrounded by rainforest. This photo was taken form the upper trail, although it almost seems like the photographer (also our very own editing-monkey) was in a helicopter. The well-maintained trails and bridges are only feet away from the falls, and as bonus, they’re completely safe. For more info, check out our complete guide to Iguazu Falls. View more wonderful pictures like this one in our photo album. Photos are contributed by our community into our Flickr pool.